Four large sunlit guest rooms each feature period antique furnishings, bed and linens as found in the finest hotels, television with VCR, free high-speed wireless Internet, desk area, and private bath. A homemade breakfast will be served in our unforgettable dining room. The relaxing front porch, parlors, sun room, and gardens are also available for our guests to enjoy. 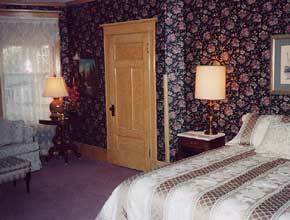 Originally the Master bedroom, the Nebraska room exhibits hand-painted woodwork. Wall sconces and a rich floral theme create a romantic setting. Curl up on the sofa in the large bay window curtained with lace. Queen bed and Full sofa sleeper. The serene Norris room looks out upon an ancient evergreen, believed to be the oldest tree in Cambridge. Unique wood details highlight the vanity area. Enjoy the intricate iron bed in black and gold, antique armoire, and rose theme. Named for U.S. Senator George W. Norris, whose historic home in McCook is open for tours. Queen Bed. The morning sun floods the refreshing Butler room, named for Senator Hugh A. Butler from Cambridge. You will reminisce of days at Grandmas house while relaxing on the iron bed with white chenille bedcover. Queen Bed. The charming Strunk room accesses the large original bathroom. You will delight in the large claw-foot tub (including shower), pedestal sink, and foot basin. The honoree is Harry Strunk, namesake for our local lake. Full Bed. One-week advance reservations are appreciated. Please provide at least 48 hours notice of cancellation. Smoking and pets are not permitted inside. Please call 308-697-3220 for rates and reservations or contact us via e-mail at hilton@swnebr.net.